President Moon Jae-in’s chief policy adviser held a closed-door meeting with South Korean conglomerate executives late last year, the presidential office confirmed Thursday, in what appeared to be the government’s attempt to address mounting concerns over the country’s economic outlook. According to Cheong Wa Dae, Kim Soo-hyun, presidential chief of staff for policy, met with senior officials at family-controlled conglomerates in late 2018. The meeting was reportedly held at a hotel in Seoul. While Cheong Wa Dae did not specify the executives present at the closed-door meeting, speculation is rampant that the meeting was attended by vice chief-level executives from Samsung Group, SK Group and LG Group, among others. Hosted by Kim Kwang-doo, vice chairman of the National Economic Advisory Council, the meeting was designed to communicate the Moon administration’s economy policy to business leaders, Cheong Wa Dae said. 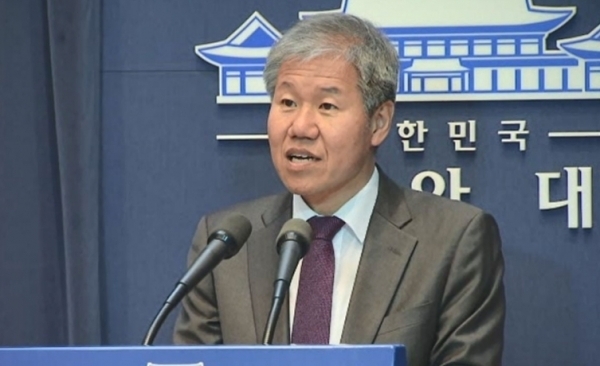 “Chief policy adviser Kim’s meeting with businessmen is not an unusual act,” Cheong Wa Dae spokesman Kim Eui-kyeom said in a text message to reporters. “(The adviser) will have a luncheon meeting with businessmen as well. His dialogue with companies will continue,” he added. Moon has been seeking to reduce disparities among socioeconomic groups under the policy of “income-driven growth,” urging businesses to carry out fairer practices while increasing investments. However, the initiative has sparked debate, as the administration has pushed several controversial policies, such as raising the minimum wage, reducing working hours and converting temporary staff positions to permanent positions.